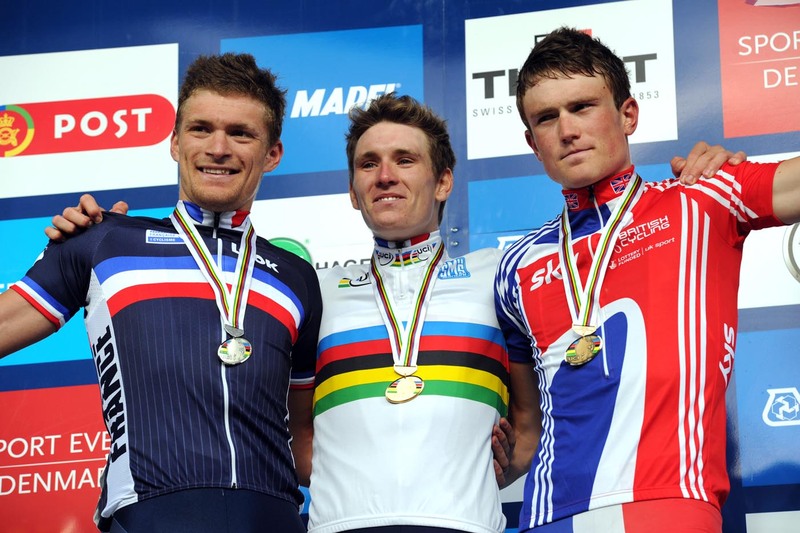 Andrew Fenn gave Britain its second medal of the day, scoring bronze in the under-23 men’s road race at the 2011 Road World Championships in Copenhagen on Friday. Fenn placed third behind a dominant showing by the French squad, with Arnaud Demare winning the race ahead of compatriot Adrien Petit. Fenn opened up his sprint after being led-out by Luke Rowe, but was ultimately out-gunned by the French pair on the slight uphill drag to the line. set to turn professional with top Belgian squad Omega Pharma-Quick Step in 2012. The bunch sprint came after 168km of racing around 12 laps of the Copenhagen circuit. An earlier escape consisting of Carlos Manarelli of Brazil and Gianluca Leonardi of Italy had put over four minutes into the bunch at one point, but they were reeled in with 30km to go. A flurry of attacks then followed, but all were carefully kept in check by the bunch ensuring a group sprint in the finale. Fenn’s bronze brings Britain’s medal tally in Copenhagen to five so far, along with Lucy Garner’s gold in the junior women’s road race; Bradley Wiggins’ silver in the elite men’s time trial; Elinor Barker’s silver in the junior women’s time trial; and Emma Pooley’s bronze in the elite women’s time trial.